To roast, remove fat in the thickest spots, leaving a little membrane of it all around to insure juiciness. Lard the leg with little slivers of garlic, especially around the bone. About 4 medium cloves cut into several slivers each should do it, or more if you only want to taste a little lamb with your garlic. Sprinkle the bottom of an oven dish with salt, and half the Herbes de Provence. Lay the roast with the fattest side up, then sprinkle again liberally with salt and pepper, and the rest of the Herbs de Provence. Roast in a preheated 450° oven until crusty brown and sizzling, about 45 minutes. 0nly then, baste with water or Madeira or port, and replace in the oven for another 10 minutes (for 4 lb.) to 20 minutes (for 6 lb. )-this time at 350°. Rest it for 10 minutes before carving. Depending on the size, it should still be quite rare in the center. While you wait for the lamb to cool enough to carve, you can strain and reduce the juices a little, whisking in the optional sweet butter. As with the turkey, the beauty of this technique is that you can keep the copious pan juices piping hot- not boiling- then place into them the tender pink slices, just at serving. The center slices can arrive at the table very rare, and the outside ones less so, but moist and juicy! This gives you marvelous control of the doneness, which to me is the essence of good lamb. Leg of lamb, 4-6 lb. fricassee of mushrooms served in a student bistro near the university in Lausanne, Switzerland. When pressed for his recipe, the old Chef would only say to use three kinds of mushrooms. So if you can, find three different ones. Cut 1# mushrooms into bite-sized pieces. Saute on medium-high heat in 3 Tbsp. butter or oil (more if you aren't counting fat), sprinkled with 1/2 tsp. HERBES DE PROVENCE. Toss and stir to sear the mushrooms, not stew them. When they are nutty brown and soft, about 10 minutes, deglaze the pan with 2 Tbsp. dry Sherry or Port, add 1 clove minced garlic, 1/2 tsp. salt, lots of fresh ground pepper, and 1/2 cup chicken stock. Many people like to use more garlic, but I rather err on the light side, to let the mushrooms shine. Stir just to absorb and evaporate the stock, sprinkle generously with fresh chopped parseley (Very Important) and if you like, add a little heavy cream. Use as a side to meat, poultry, or vegetarian main dishes, to stuff omelettes (yum), to mix with rice or toss with pasta, to enrich sauces or pan juices, or on its own. On bitter winter days in France I took refuge in the house of an old jeweler near the Marne River. Georges Fillipot was a great fisherman and a fine cook, and I will never forget his Boeuf Carottes. Beef is disappearing from many tables, but it still has its honored place in Western cuisine, as in this hearty braised classic. Red wine and carrots give it a rich sweetness. Trim and cut a 3-pound pot roast of beef (sirloin tip is best) into 2" cubes, and marinate overnight in one cup dry red wine, 2 Tbsp olive oil, a bay leaf, 1 Tbsp. HERBES DE PROVENCE, one clove crushed garlic, half an onion, and 6 peppercorns. Remove meat and dry well, discarding marinade. On high heat in a heavy casserole, brown the meat on all sides in 3 Tbsp. olive oil. Remove, lower heat, and in the same pan, brown 1 cup chopped onions, or 20 little boiling onions. Deglaze the pan when they are toasty-brown with 1/4 cup Brandy or stock. Replace the meat, add 1 Tbsp. HERBES DE PROVENCE, and cover with 2 cups dry red wine (preferably what you're going to drink). Add a bay leaf, 1 tsp. salt, 1/4 tsp. black pepper or red pepper flakes, and 2 Tbsp. tomato paste. Simmer, covered, for 1-1/2 hours, then add 2 pounds thick-sliced carrots and 2 cloves minced garlic, and simmer, not boil, another hour. Add water or stock as needed to keep it covered with liquid. To finish, salt and pepper to taste and serve just as is, or, to thicken and enrich it, you might puree a few of the carrots, adding them back to the sauce. Garnish with chopped parsley or chives, and serve with boiled potatoes or fresh pasta. There is good reason to call this comfort food, the world over. To coat steaks, chops, fish or chicken before grilling or broiling, mix 1 Tbsp. of HERBS with 1/4 cup olive oil. A dash of worcestershire is an option, too. Salt and pepper to your taste. Try summer vegetables tossed in the above mix and grilled or broiled (not too hot) until crisp-brown on the outside and soft in the center. To speed their cooking and relieve congestion on the grill, mix with the oil and HERBS, then prebake 1/2 hour in a medium oven. You can grill them to sear and finish. Especially good this way are japanese eggplant, squashes, and peppers. 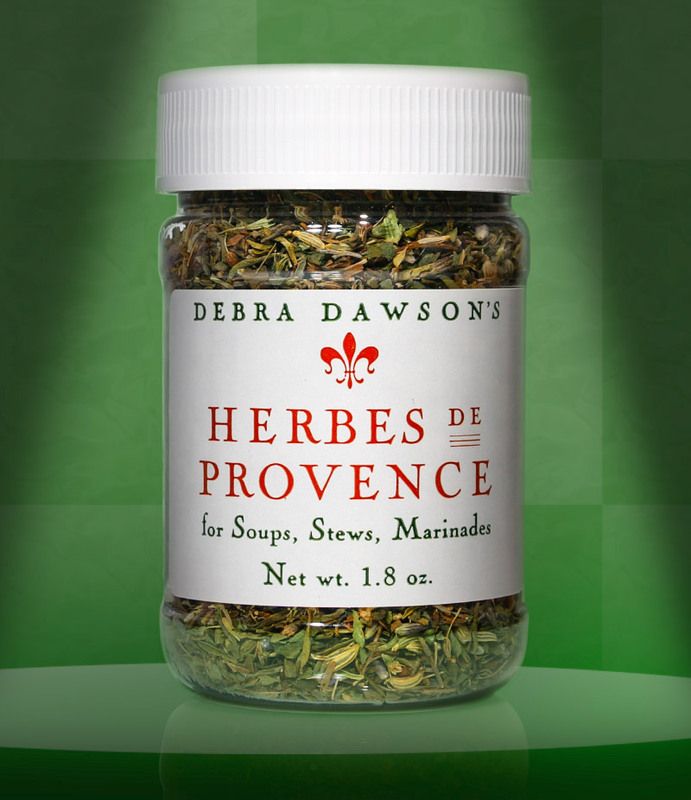 Use HERBES DE PROVENCE in lamb stews, with garlic, vegetables, new potatoes or beans. HERBES DE PROVENCE are wonderful in ratatouille, the classic Provencale stew of eggplant, zucchini, peppers, and tomatoes. *Use to flavor pates and terrines.